The top of the dial showing a wind rose with 32 directions and compass viewing hole. The bottom of the dial showing a combined lunar volvelle with the phases of the moon and a table of epacts (an aid for calculating the age of the moon). A close up of the top of the dial. The portrait of Lewis Evans, who can be seen holding the diptych dial. The ivory diptych dial was the quintessential Renaissance gadget. To call it a sundial is to underplay its ambition and ingenuity – it was the sixteenth-century equivalent of a smartphone with a multitude of apps. 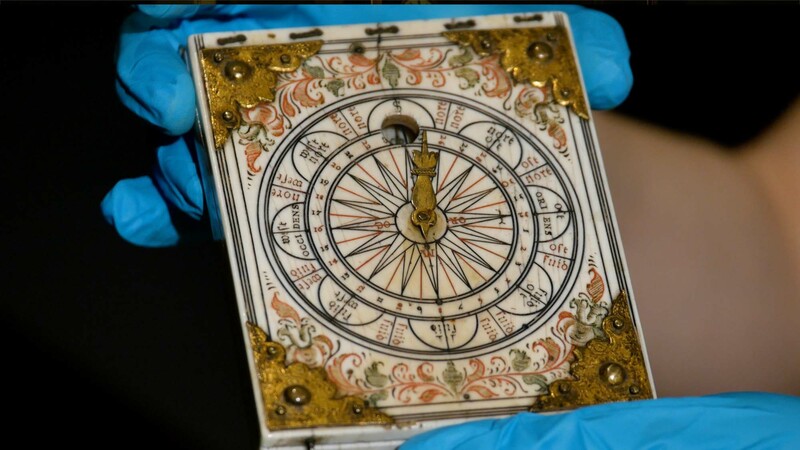 With a compass to orient the instrument correctly, the device opened up to reveal multiple sundials of different types, telling the time in different hour systems and for use in different places. Added bonuses typically included an indication of where the Sun was in the Zodiac, and a rotating disc or volvelle to provide calendrical, astrological and lunar information. There was even sometimes a wind vane for weather prediction. Diptych dials were usually uniquely designed and manufactured, with neat and colourful decoration to set an owner’s stamp of pride on a stylish object of desire. Nuremberg was the European centre of manufacture but the raw material came from African elephant tusks, so the finished products were part of a global system of trade. The instrument here is a fine but fairly typical example, dating from about 1600. Why select it from the literally dozens in the Museum’s collection? Because it appears in the above portrait of Lewis Evans (1853–1930), the founding benefactor of the Museum. Evans was passionate about mathematical instruments, particularly those used for timetelling. He was scholarly in his interests, assembling a significant mathematical library to illuminate the objects he acquired, which were all individually catalogued on cards. His whole collection of thousands of instruments and books was offered to the University of Oxford, where it was initially displayed in the upper gallery of the current Museum, and known as the Lewis Evans Collection. A selection of books from the Lewis Evans collection. Astronomical manuscript from the Lewis Evans Collection. Astronomical manuscript from the Lewis Evans Collection, with fold-out diagram. As a collector, Lewis Evans concentrated on a small range of horological instruments (as opposed to clocks). He was principally interested in sundials, both the objects themselves (as above) and texts about them. He acquired manuscripts as well as printed books, extending even to a small collection of printed ephemera, always focused on non-mechanical ways of telling the time. The precisely focused nature of Evans’s passion appears eloquently in his books and manuscripts. A high proportion have a neat little note written by him at the front saying which particular pages refer to sundials. Even though the work might cover surveying, navigation and armillary spheres, Evans purchased it for the sundial section. His manuscript collection is small, about 80 volumes, yet it is a uniquely rich archive of its specialised theme. It is also very concentrated in date, chiefly from the 17th and 18th centuries. Because he collected all over Europe, it is refreshingly cosmopolitan: seven languages and at least nine (modern) countries are represented. Some volumes are scruffily written notebooks or exercise books, while others are beautifully written and original monographs representing many hours, or years, of painstaking work. Most are illustrated with sundial designs, or even feature actual working instruments on paper. Some were written by students or practitioners, but inevitably many are the work of more highly-educated men – teachers, priests and members of religious orders. Mathematical expertise was common among the clergy, but it is hard to resist the thought that work requiring such concentration and so many hours of patient dedication may have provided a form of religious discipline for at least some of these writers. A biographical account of the Museum's founder by Tony Simcock. See the full list of objects in the Lewis Evans Collections.